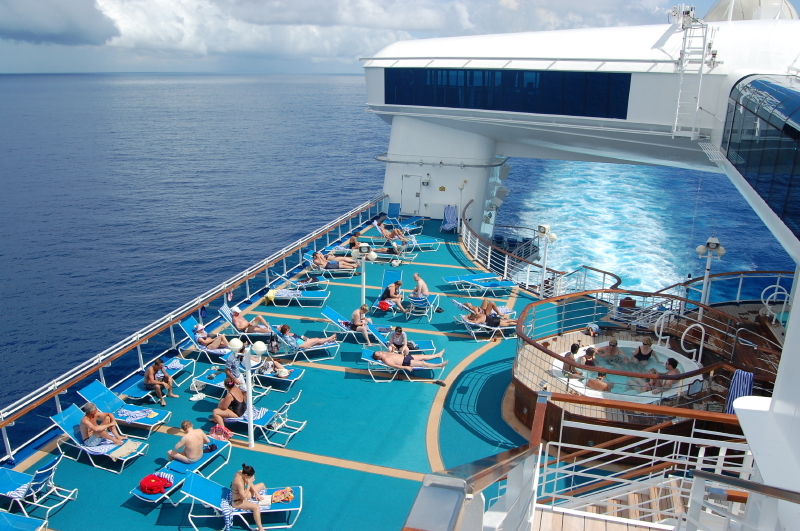 Princess Cruises has an ideal summer itinerary combining visits to several "tropical" islands on an impressive ship with a convenient close-to-home port. While considering options for an early June cruise, we also wanted several leisurely days at sea and to visit some far-away "exotic" locales. 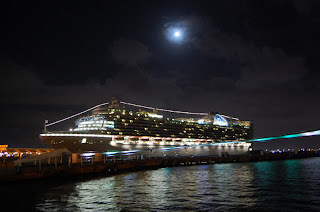 So, we didn't hesitate in booking passage on the Caribbean Princess, sailing nine days round-trip from New York City to Bermuda and to the Caribbean ports of San Juan, Puerto Rico, St. Thomas, Virgin Islands and Grand Turk in the Turks and Caicos. This was designed to introduce our son, Jeff, daughter-in-law Lisa and grandson Adam, three, to big-ship cruising. Sailing from New York is a must-do experience, in this case from the Red Hook Terminal in Brooklyn. 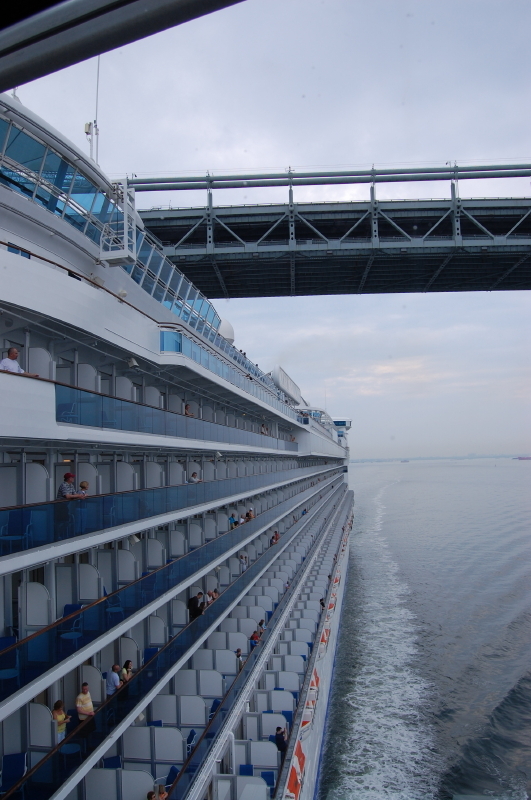 "It doesn't get much better than sailing with the Manhattan skyline in the distance, passing the Statue of Liberty and going under the Verrazano Bridge," said Karen Candy, Princess publicist. 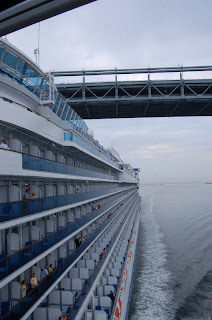 The immense size of the 18-deck ship stretching to the sky made it seem like it just narrowly squeezed under the bridge, with the stacks just clearing it. 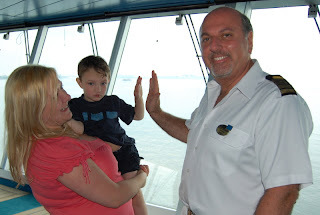 "I am always a little nervous and tell everyone to look up at the top of the ship to see just how close we come to the bridge," said Captain Marco Fortezze as the vessel headed out into the Atlantic Ocean. Adam congratulated him with a "high five." This itinerary is "extremely popular," offering a tropical escape with the convenience of sailing round-trip out of New York, Candy said. We avoided the airline hassles and expense by taking an eight-hour drive along the New York Thruway, through picturesque lush green hills, forests and lakes of Pennsylvania and into New Jersey. Stopping for the night at an inn in East Rutherford, N.J., it was less than an hour to the port the next morning with convenient parking beside the ship ($20 U.S. daily fee). The GPS guiding us through the Manhattan maze paid for itself on this trip alone. 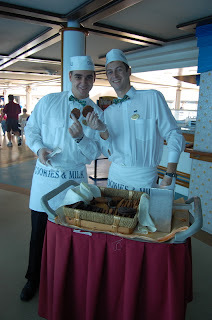 Arriving around noon, embarkation was a breeze and we were on the ship exploring -- searching out our staterooms and the lunch buffet -- within 20 minutes. The Caribbean Princess is quite a sight, carrying 3,286 passengers on this 4,500-kilometre voyage. Along with 900 balcony staterooms and a deck of mini-suites, the five-year-old ship recently added a piazza-style atrium with street entertainers, International Cafe for specialty coffees and sweet treats, and Vines, a wine, seafood and cheese bar. There's also the adults-only retreat Sanctuary and the new alternative (extra charge) Crown Grill steak and seafood restaurant. 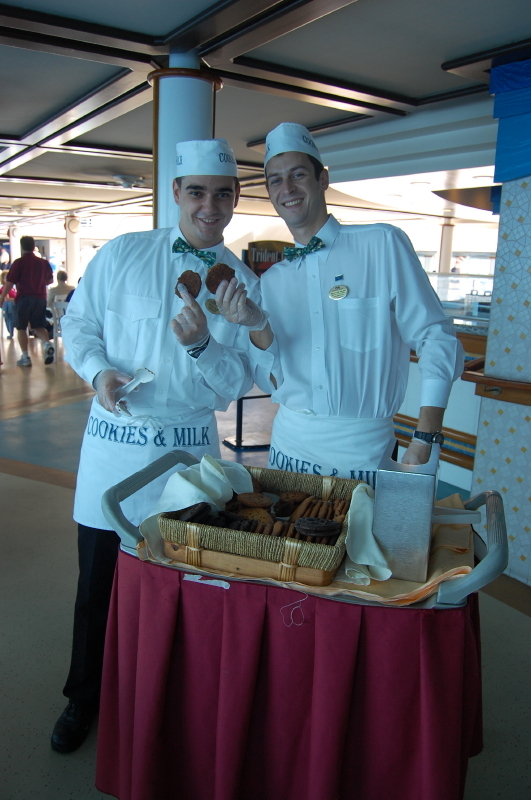 And, every afternoon the "cookies-and-milk" men tour the pool areas offering fresh-baked cookies and cold milk. As the largest ship we've sailed on, it didn't feel crowded, although it got quite busy in the atrium and bar/club areas with the popular nighttime shows filling up quickly. Along with traditional dining at 6 p.m. and 8:15 p.m. in the Palm Dining Room, there are two "anytime" dining rooms, the 24-hour Horizon Court and room service, Sabatini's Italian restaurant, Cafe Caribe with "themed" buffets, "ultimate" balcony dining, a pizzeria, burger and hot-dog grill, Scoops ice cream bar and more. We also took part in the Chef's Table, a special treat for "foodies," hosted by executive chef Nilo Palma assisted by Giuseppe Franchina, maitre d' hotel. This is a three-hour-plus extravaganza of sights, tastes and conversation, starting with a galley tour at the height of the dinner rush where we enjoyed French champagne and hors d'oeuvres. The specially prepared multi-course tasting dinner paired with wine included blue crab margarita with avocado and mango, Alaskan salmon tartare, braised escargot vol-au-vent and trio of beef, veal and pork tenderloin on a "medieval spiked flambe roaster au jus." The Caribbean Princess also has the immense "Movies under the Stars" screen where we watched the NBA finals under the stars and a full moon. While in Bermuda, we visited the aquarium and zoo that included a scenic 45-minute boat ride from the West End dock. In San Juan, we took the five-hour excursion to the El Yunque Rainforest and hiked beside huge waterfalls and climbed lookout towers. With the sailaway not until 11 p.m., we strolled along the malecon (waterfront boardwalk) taking in the hot, hot, hot Saturday Latin nightlife. St. Thomas being the duty-free shopping mecca of the Caribbean allowed for some time in the shops. After that we hired congenial "Big Mac" to take us on a scenic tour in his open-air bus/taxi to Magen's Bay Beach, considered one of the top 10 beaches in the world. 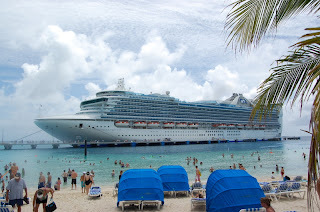 Grand Turk was a "beach day" as the immense white sand strip is adjacent to the ship along with Jimmy Buffet's Margaritaville complex of pools, swim-up bars, restaurant and shops. The ship's Bermuda-Caribbean itineraries continue through mid-August after which it does Canada-New England sailings. 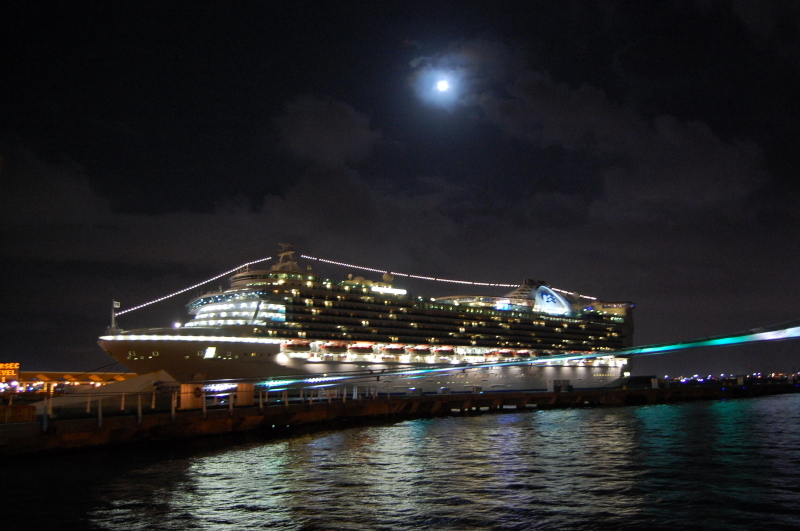 In November, it repositions to San Juan for seven-day southern Caribbean voyages through to next May. After just one sailing, the "newbie" cruisers are hooked and asking: "When can we sail again?" Bermuda-Caribbean nine-day fares (2011) from New York are from about $945 (interior cabin) to $1,258 (oceanview), $1415 (balcony) and $1,678 (suites). The Chef's Table for up to 10 diners is offered several nights a cruise cost $75 U.S.; reserve early.